Show them you care with a custom J Paul crystal recognition award. When spring-cleaning comes around, your employee has a choice to make: do they want to keep the employee recognition awards you’ve given them, or do they decide to throw them out? Ultimately, do they value the awards you’ve given them? If your staff is getting rid of their employee recognition awards, they’re likely forgetting why they earned them in the first place. In their eyes, a cheap, mass-produced recognition award doesn’t demonstrate the appreciation they deserve. A thoughtful, decorative, and custom employee recognition award goes a long way, benefiting both you and the employee. Give your employee an award that they can be proud of. With pride and possession of their award, they can always be reminded of why their employer recognized them. If it’s created in a custom, thoughtful way, this award will not only continue to inspire them, but will also inspire their co-workers who’ll take notice. For this reason, J Paul doesn’t limit the possibilities in creating employee recognition awards; the J Paul Company wants to help you find and create the right award for you and your employees. 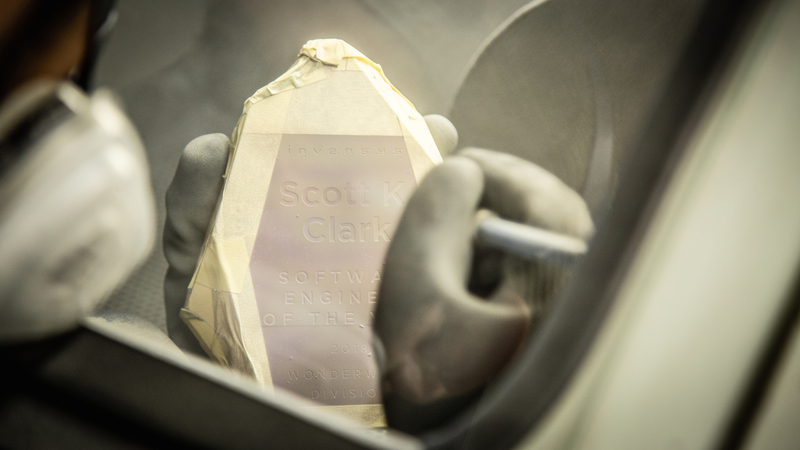 Over the years, we’ve recognized that there is no better way of doing so than through the use of crystal awards. Rather than becoming desk clutter that eventually gets tossed away, a J Paul crystal award becomes a centerpiece that warrants conversation. However, we recognize that crystal awards may not be within your budget or fit for your company’s style. That’s why we offer an extensive line of employee recognition awards that vary in size, shape, material, and style. No matter your vision, let us bring it to life. When working with J Paul, know that you’ll be guided through each step of the process. We’ll get down to the root of what your company stands for, ensuring we create employee recognition awards that can connect with your brand and its employees. If you want your employees to feel valued and to encourage them to strive for excellence, contact the J Paul Company today to discuss how we can create custom employee recognition awards for you.